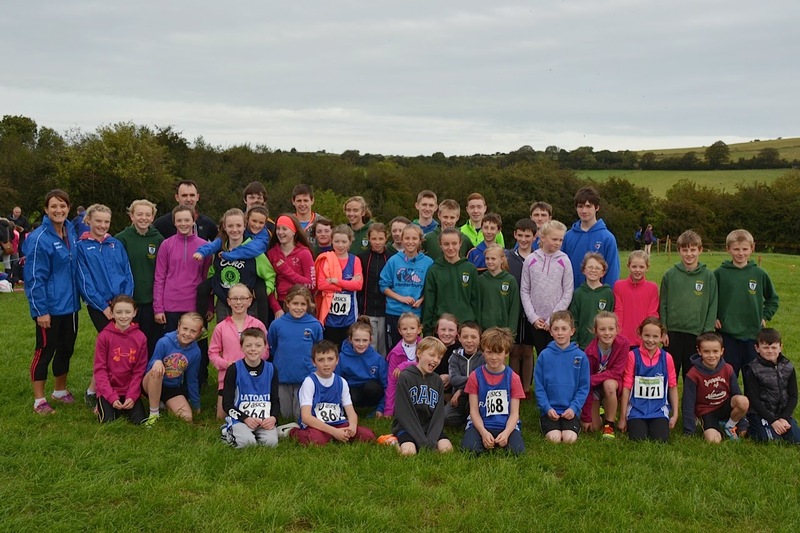 The Meath even ages cross country took place at Greenanstown, Stamullen yesterday. We had a big turnout this year in all age groups with 80 athletes entered. The U10s got the day off to a winning start with gold in the girls u10 team event, some great individual performances came from Sophie Quinn 1st, Laura Kelly 2nd, Niamh Murray, Amy Forde and Lily Nannery. The u10 boys team finished 2nd, Harry O’ Connor and Eoin Kane were impressive individually finishing 1st and 2nd. The u12 girls also took gold in the team event with strong runs from Ella Healy 1st, Lili O Connor 3rd, Eabha Toole 4th, Amelia Campbell, Molly Keane and Grace Mahon. The u12 Boys finished 2nd to a very strong Dunboyne team, Tom Kilgannon finishing 4th, Oisin Kelly had a great run for his first time out finishing 6th, Fionn Drummond 10th, Kyle Witter 11th and Matthew Hayes 13th. The U14 girls team finished 2nd, Karen Hayes leading the girls home in 3rd, Aoife Kelly another first timer finishing 11th, Rachel Doherty 24th, Maria Rogers 27th, Sophie O’Connor 30th and Emma Coroner 34th. The u14 boys all ran very well and their efforts paid off winning gold in the team event, a great team performance with Harry Haskins finishing 7th, Daragh Casey 11th, Fergal Kilgannon 13th and Matthew Buckley 15th. We had great numbers in the girls u16 event this year and our girls all performed very well, Aine O’Connor going from strength to strength this year finishing 2nd, Niamh Gannon, Kate Byrne, Aoife Reynolds and Jennifer Bradley all competing in their first cross country for the club had solid runs earning them 2nd place in the team event. The boys u16 event had a very strong field this year with International Athletes Paddy Maher, Alan Monaghan and our own Alex Hunter competing. In a tight race Paddy Maher came out on top followed home by Alan Monaghan and Alex Hunter, Ben Mahon running for the club for the first time in a number of years finished in a strong 6th place, unfortunately due to some late withdrawals we were unable to field a team in this event. Our U18 And Novice men competed in the 6k event, the Novice men’s team were just outside the medals finishing 4th, good performances from Ian Phelan finishing 11th,Hugh Kelly 15th, Earle Doyle 19th and Alan Phelan 21st. Philip Marron, finished 3rd for the u18s, Ciaran McCarty 5th and Ryan O’ Connor 9th, the boys team finishing 2nd overall. Well done to all our athletes who competed yesterday and congratulations to all who have qualified for the Leinster’s championships which will be held on October 26th in Avondale, Co. Wicklow.